University of New South Wales (UNSW), Project. 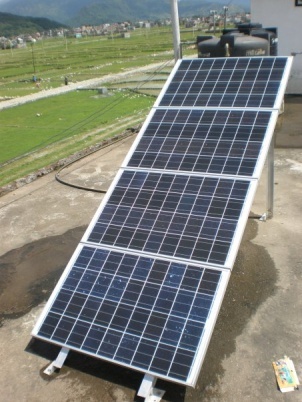 The major project undertaken in February 2008 involved installing PV systems in a high school at Borlang-7, a small village about 3 hours bus ride out of Gorkha. This was carried out by a team from UNSW in conjunction with local personnel from RECED. The high school has about 500 students. Like many Nepalese high schools well away from the major cities, only about half the funding required to run the school is provided by the government, the remainder of the budget has to be found locally. As such installing lights and power capable of providing computers for the school was again seen to be a good project with wide benefits for the local community. 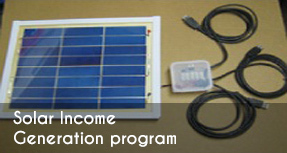 The PV system for powering the computers consisted of four PV panels in parallel (87 W, Kyocera, KC85T). These were roof mounted facing due south attilt angle of 30° (Fig. 7). Due to the latitude of most of Nepal being ~28° N, a tilt angle of 30° is commonly used. The monsoonal influence on the solar irradiation would actually push optimal tilt angles lower but this is not standard practice and so was not implemented at Borlang-7. The batteries for the computer system consisted of four Trojan, deep cycle 100 Ah batteries in parallel and were charged via a Steca PR3030 charge controller, capable of handling 30 A (Fig. 8). Two smaller PV panels (Kyocera, 40 W) were installed with their own charge controller (Sundaya) and flooded lead acid battery (Volta 95 Ah ), which are connected to twelve 11 W fluorescent lights in 4 classrooms, the staff room, the battery room and the Principal’s office. 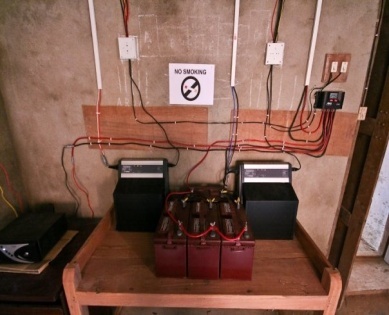 Shown in Figure 7 is the completed installation of the charge controllers and batteries in the battery room. On the left hand side of the picture, the 600 W inverter can also be seen. This provided AC power for the computers. Battery roo m showing the completed installation. The inverter can be seen on the far left, which is connected to the 4 batteries in the centre of the picture which power the PC and laptop. The charge controller for this system is mounted on the wall. The two black boxes contain the charge controllers and batteries for the two lighting systems. The remaining figures show wiring being installed in one of the classrooms (Fig. 9), and the same classroom late in the afternoon with lights on (Fig. 10), installation by the local carpenter of the mounting bracket for one of the two pole mounted PV panels (Fig.11), and testing of the computer (Fig. 12). The original location of the main array was to have been directly over the room which was set aside to house the batteries and next to the room for the computers. However upon inspection this location was found to be adversely affected by shading of a large tree (Fig. 7). After much negotiation it was decide to relocate the PV panels to an adjacent roof well to the west of the tree. This meant that the PV panels were unshaded typically between 9 am until 3 pm throughout the year. Appropriate cable of 16 mm diameter copper was eventually located, however it was commented that such thick cable was unusual for PV systems in Nepal. UNSW team wiring up lights in one of the classrooms. The initial computers were standard desktop PCs with CRT screens. A laptop belonging to UNSW was trialled and shown to use about 25% of the energy of the standard PC and screen. Initially we were unsure about the acceptability of laptops and the additional expense. However given the superior efficiency of a laptop, a single laptop was purchased and sent back to Borlang-7 and is currently in use as well as one of the original PCs. If the laptop is found to be acceptable then a second laptop will be installed and the original PC removed. UNSW student David Mason mounted PV panels. testing out the PV powered computer. 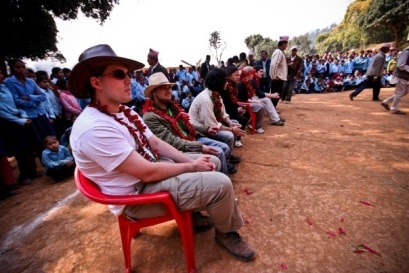 After completion of the project there was a wonderful farewell organised by the community for the UNSW/RECED team. There were a number of cultural displays which was part of the local community’s expression of appreciation (Figs. 13 and 14). There were also a number of other cultural displays which often occurred late into the night, and the dancing and singing were incredibly spontaneous and joyous. Special songs were composed to thank us for what we had done. The UNSW team from 2008 and RECED personnel are shown in Fig. 15, taking in some of the scenic beauty of Nepal after the completion of the project. Since the completion of the project in Borlang-7 in February 2008, the systems have been monitored carefully by staff and students at the school. Shown in Fig. 14 is a graph of the battery voltage for the three systems installed (April – September 2008). The two lighting systems are showing battery voltages typically in the range of 12.3 V to 13 V. For batteries that are neither being charged nor discharged voltages between ~12.1 to 12.7 V give an indication of the state of charge of the battery. It is difficult to say from this data whether the batteries are in good condition or not. Any battery voltages higher than 12.7 V indicate that the readings were taken whilst the system was receiving charge. For the PC battery system the voltages are consistently between 12.4 and 12.7 V. Again it is difficult to asses whether these voltages give an accurate indication of the state of charge for the system. Further correspondence with the staff who are gathering the data will hopefully clarify the issues but it is heartening to see that the systems are being monitored on a regular basis. Lee, Tim Larsen and Ramesh K.C. (RECED) (not present: Claire Disney, Gilbert Jin). 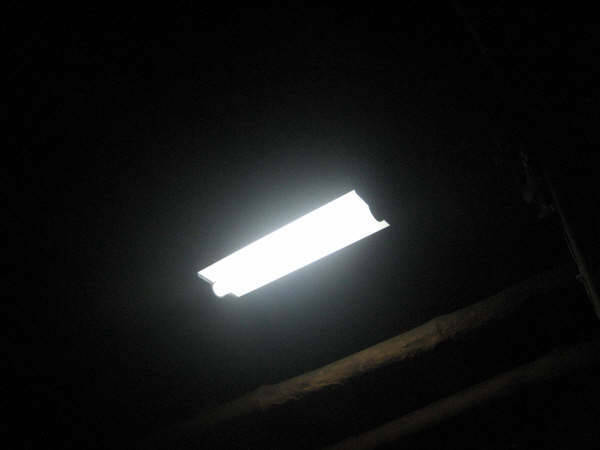 The PV lighting systems in Sankhe health post were revisited in February 2008 and found to be in a fairly good condition. With the changes in personnel at the health post the usage and maintenance of the systems had changed as well. 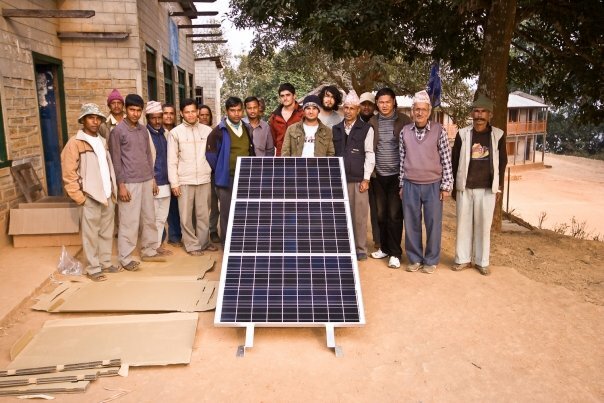 However anecdotal evidence acquired from discussions with other Nepali users of PV systems is that typically batteries in PV systems in their experience never last longer than 2 years. Discussions with some PV suppliers in Nepal also viewed this as a normal state of affairs. So we consider that the system is performing relatively well as the majority of batteries at the health post are still operational after 4 years. For the new system installed at Borlang-7 we are encouraged at the continuance of monitoring of the batteries by the local staff and students. 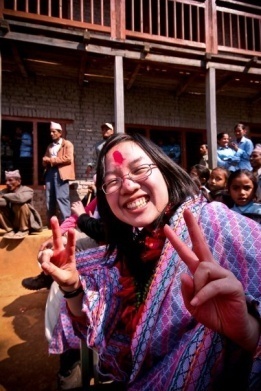 One of the authors (Long Seng To) will be returning to Nepal in Feb 2009 and will have the opportunity to visit Borlang-7, check the systems and also to supply a second laptop computer. 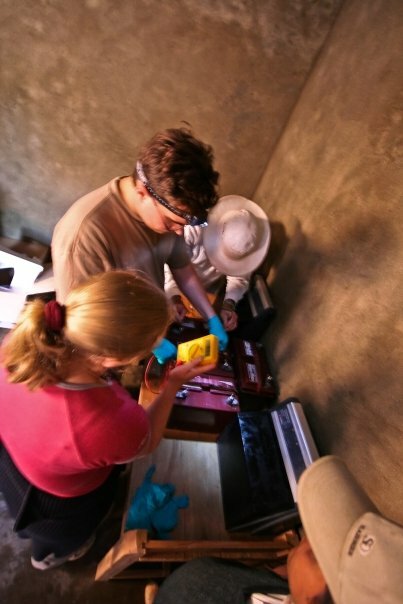 Both UNSW teams that visited Nepal were assisted greatly by various donors. For the 2004 trip we gratefully acknowledge the support of Origin Energy, STA, ANZSES, and a myriad of private donors. For the 2008 trip we gratefully acknowledge the support of Mrs E. Williams and Lisa Dobinson (who also greatly contributed to the installation at Borlang-7!). Both teams are grateful of the financial support provided by the School of Photovoltaic and Renewable Energy Engineering, and the Faculty of Engineering. Special thanks to Dr. Richard Corkish and Prof. Stuart Wenham for their support. 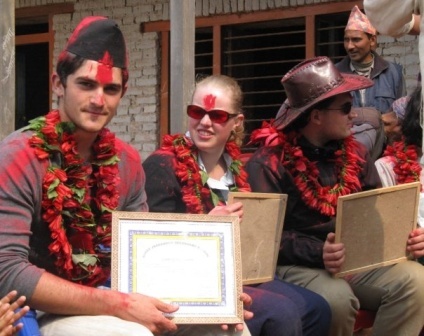 For both projects the UNSW teams were warmly welcomed and farewelled by the villages of Shanke and Borlang-7. Not many of us have ever experienced anything quite like that before in our lives! On behalf of all the UNSW team members we would like to thank the communities of both Sankhe and Borlang-7 for their wonderful hospitality, for their cultural programs of singing and dancing and for the wonderful meals that you provided for us. 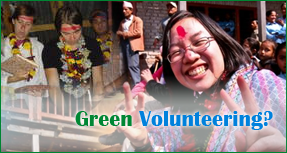 Special thanks to Dr Vanu Poudel and everyone involved with the Sankhe project. Also special thanks to Mr. Mukti Dhakal (Principal, Shree Jageshwor Secondary School) and everyone involved with the project at Borlang-7. For all of us who were involved in the projects we will always have many wonderful memories of the people we met and worked with.